I consider myself a serious, dignified journalist, and I should be writing about hard-hitting stuff like corruption and grade inflation and that one warm spot on the walk between Annenberg and Canaday. I’ve been Old Faithful at pitch meetings this semester, throwing out bona-fide gems the way a lonely child throws food at pigeons in Washington Square Park. But what’s that worth to the Crimson bigwigs in the cloistered halls of 14 Plympton? Not very much. So I’m writing about these pig-shaped sippy cups, and I’m not happy about it. You’re probably asking: Why does anybody have to write about Animal-Shaped Vessels? I certainly asked that. For the past semester, the magazine editors asked themselves that same question. Each week, a different reporter suggested that we pay a visit to the hippo-shaped flasks, and each week they pushed it off. Still, someone has to pay the piper. Congrats, Harvard Art Museums, I guess you got what you wanted. 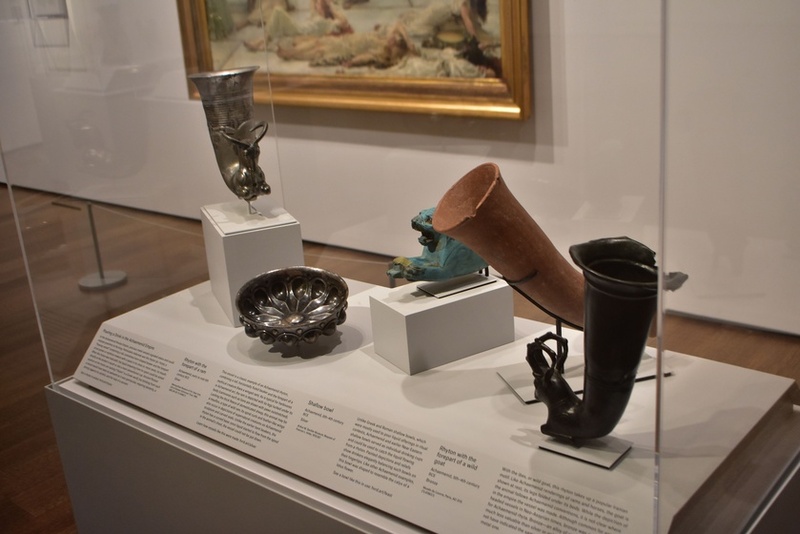 But even as I stand between a duck cup and a wild cat rhyton, I know that I’m better than this. The vessels themselves take up only two rooms. At one point my roommate, whom I dragged along, noted that he preferred the pieces in a neighboring room. I had to inform him, much to his dismay, that those pieces belonged to a Géricault exhibit, and that he had to return to the room I was in. You know, the one with the vessels shaped like animals. The exhibit opens with a description of ancient feast culture, explaining that “the consumption of wine, beer, and other mind-altering alcoholic beverages elevated the mood and loosened the tongue, encouraging new relationships and strengthening social bonds.” This sets an appropriately baffling tone for the exhibit: the phrase “mind-altering alcoholic beverages” can only have been written by a 12-year-old temperance activist in the body of a DAPA fellow, while the latter part sounds like the work of liquor lobbyists. Beneath this introduction is a note that the gallery received a “major grant from the National Endowment for the Humanities.” Standing on that spot, on the east side of the third floor of the Harvard Art Museums, I almost became a Republican. And, mark my words, if people knew that the government of these United States of America had given a “major grant” to Harvard University to put on an exhibit about gazelle shot glasses, there would be a fully warranted revolution. The first piece I saw was called “Pitcher in the form of a hippopotamus.” I’m a simple boy with simple tastes, so I feel quite strongly that this should have been called “Hippopotamus pitcher.” We would have been quite aware, even with that more ambiguous title, that the pitcher was merely in the form of a hippopotamus and not a literal hippopotamus. Some of the pieces in the exhibit are noticeably less animal-shaped than others. The “back panel of a funerary bed” is on display, killing any semblance of festivity. The panel’s carving features a man raising “a rhyton with the head of a bull” — a tenuous justification for its inclusion. This is the curatorial equivalent of changing all the periods in a 12-point font essay to 14-point font, and I almost have to hand it to them for their ingenuity — but I won’t, because I could be writing about anything else right now — even bike lanes. Bike lanes. The museum has outsize confidence in the hipness of its exhibit and has attempted to claim the Instagram hashtag “#partyanimals.” The effort seems halfhearted, as the Harvard Art Museums have doomed themselves to compete with 461,000 #partyanimals-related posts. Two of these are about the exhibit. The remaining #partyanimals posts feature animals wearing party hats and people drinking. I stumble upon a photo of a Scottish tabloid featuring this “Mel B Exclusive”: “I Snorted 6 Lines of Coke A Day On X Factor.” Intended or not, this seems to be the the thing I like best about the exhibit, of which my only lasting takeaway is that the Ikea highballs my family uses might someday find their way into an NEH-sponsored museum.